We have good news for all those applicants who are searching for the Government Jobs in Kerala State. Here, In this article, we are going to describe all the detailed information about the related to the Gujarat High Court Assistant Recruitment 2018 in the following sections of the article. Therefore, all the interested applicants must focus on the below article and grab all the details from here. Candidates may apply online for the recruitment from the official website of the Gujarat HC that is www.gujarathighcourt.nic.in. For getting more information you can bookmark our page because Our Careerjobs360 professional team updates this page on regular basis as per the latest information. The Gujarat High Court has depicted the job notification for Gujarat HC Vacancy 2018 on its official portal. The department has invited the application forms from the eligible and passionate candidates for filling up 767 Assistant Position in the high court. Skilled and deservi9ng candidates can fill the online Gujarat High Court Application Form 2018 from the official website that is www.gujarathighcourt.nic.in. You may submit the online application form on or before the deadline date i.e. 14th July 2018. Moreover, details related to the Gujarat HC Assistant Jobs 2018 such as age criteria, educational qualification, and application form fee, important dates etc are given below. The Gujarat High Court is the High Court of Gujarat State. It was formed on 1 May in the year 1960 under the Bombay Reorganization Act, 1960 after the state split from Mumbai State. It came into existence on 1 May in the year 1960 as a result of bifurcation of the former State of Mumbai into two States of Maharashtra & Gujarat. The High Court started functioning near Akashwani, Navrangpura, Ahmedabad. The candidates who are going to apply for Gujarat High Court Jobs 2018 then they must know the eligibility conditions of the vacancy. Here, you can check all the eligibility criteria from the below article. If you are eligible for the post then submit the online application form on or before the deadline date that is 14th July 2018. Maximum age limit for the applicants is 35 years. Age Relaxation: The upper relaxation in age will be applicable only for the reserved category of candidates as per the rules and regulations of the government. Selection methodology: The candidates will be shortlisted on the basis of their performance in the following selection levels. Salary band: The finally shortlisted contenders will get handsome amount of pay band Rs. 19,900/- to Rs. 63,200/- per month. 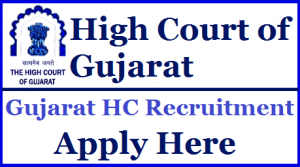 How to Apply Online for the Gujarat HC Assistant Recruitment 201? All the eligible and interested applicants may apply online for High Court of Gujarat Recruitment 2018 on or before the deadline that is 14th July 2018 from the official website of the department which is given in the below article. Here, we are also providing some steps for your help. All the applicants must follow all the given instructions very carefully & then you may apply online for Gujarat High Court Jobs 2018 Easily. After that, Read all the instructions from the notification very carefully before applying for the post. If you are eligible and then hit the apply online button. Upload the scanned passport size photograph and signature on it and remit the online application form fees. At last, candidates must take the printout copy of the application & Keep it safe for further use. The Gujarat High Court will release the Gujarat HC Assistant Hall Ticket 2018 on its official website. A large no. of candidates had applied and now they all are keenly looking for the admit card here & there on the internet. You may download your admit card after releasing on its official portal. Here, in this article, we mentioned all the information related to the Gujarat High Court Assistant Recruitment 2018 in the above description. All the eligible candidates must read this full article & then apply online for this recruitment from the official portal that is given at the end of this article. For more details please check our careerjobs360 website and stay connected with us.